Best Dog Training Madison WI - Dane County area. Welcome to Bark Busters Madison where we provide in home dog training for you and your dog... one-on-one! Welcome. If you have arrived at my website, your dog must be having some issues … no worry, every dog does! 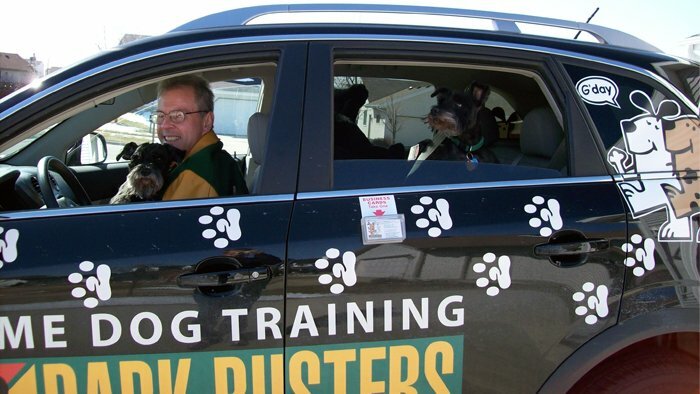 For more than 10 years as a Bark Busters dog trainer and behavior therapist, I have successfully trained thousands of dogs throughout Madison, WI and Dane County. My name is Greg Reetz and I would be happy to talk to you personally about your dog(s) and family situation and how we can help bring some peace and harmony to your household. How do I know I can train your dog? · We teach you to communicate with your dog. The reason your dog doesn’t understand what you are saying is because of a failure to communicate. You speak English and your dog speaks, well dog. Dogs learn to communicate from their Mom using body gestures (tail up or down, head up or down, etc.) and voice commands (barking, growling). They don’t speak English or use clickers, prongs or treats. One of the reasons our Bark Busters dog training techniques are so successful is because we teach you how to get your dog to listen to you in a language he understands. As you and you dog begin to develop a relationship based on you being the leader and the “Top Dog”, your dog will no longer vie for control. · You will see results during the first lesson. Once your dog respects you as the alpha dog, you will see immediate results in your dog’s behavior during the first lesson. Practice the training exercises for 10 – 15 minutes/day and you will be well on your way to a well-behaved dog. · Our methods often succeed where others fail. Not only is Bark Busters vet recommended, but our dog training methods often succeed where others fail. In fact, other trainers refer our services because their methods aren’t equipped to handle some of the tough dog issues like aggression and sibling rivalry. a. “I have had a few trainers come out and try to get Fifi to behave with no luck and great expense. I heard about Bark Busters through a friend and their lifetime guarantee, so I decided I’d give them a try. Greg has helped immensely to get her under control” Minerva M.
· We only use positive methods – no punishment or force. Aggression often breeds aggression. That’s why Bark Busters uses only positive reinforcement to get your dog to focus and establish a relationship based on trust, loyalty and respect. To me, dog training is not a career but a passion. I love to see the look on my client’s faces when they are awestruck by results. Let me help you to have a well-behaved family companion! Fantastic, immediate results! Barking has stopped and Greg provided us with the tools to establish ourselves as pack leaders. He taught us that their barking was a result of no pack leader present. With continued, repetitive sessions we hope to continue the great behavior! We were very pleased with the techniques and tips that our trainer helped us to learn. He was adept at identifying the reinforcing behaviors we were providing that increased Gryffin's issues. With his help Gryffin has decreased pulling, barking incessently, and showing aggression to people when they rang the doorbell.